Rotherham College has been nominated for a national award for its accountancy clinic which sees students offer local businesses accounting services for free. 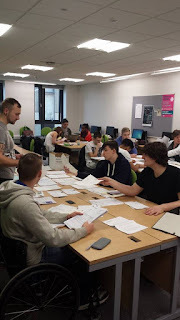 Part of the Business, Computing and Education department, students studying different accounting qualifications at the college, the innovative partnership is supporting the borough's small enterprises and providing real world work experience for the students. The clinic, which is available for local businesses within the South Yorkshire area to receive help with their accounts and bookkeeping, has received a nomination for the Oxford, Cambridge and RSA Examinations (OCR) Award for Innovation in Further Education. Each year since 1994, the Association of Colleges (AoC) have held the prestigious AoC Beacon Awards to celebrate "the best and most innovative practice among UK further education colleges." The college has received the nomination because the Accountancy Clinic demonstrates a way that links the theory, practice and employers together in a way that hasn't been seen before. Ken Merry, Head of Business, Computing and Education at Rotherham College, said: "To be shortlisted for an AoC Beacon Award is a great achievement - it is further testament to the hard work, effort and determination that the delivery team show through their on-going commitment to the excellent concept of The Rotherham College Accountancy Clinic and the students who have benefited from the exposure to real life accountancy. Without the team working on this project and the students being involved this would not be possible. I am very proud to be short listed and hopeful that we can go one step further and win." The decision process involves a visit from the deciding panel at the AoC and the winners will be announced at the AoC Annual Conference in November. The Accounting department has received a number of accolades throughout the last year including winning Public Sector College of the Year at the PQ Awards and being awarded AAT Centre of the Year.